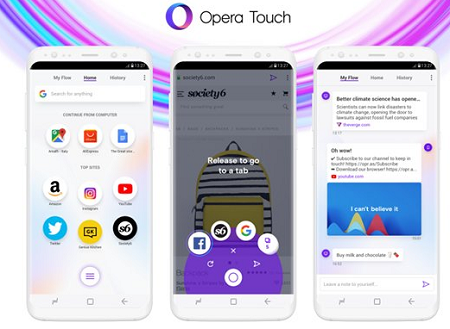 Few days after the company discontinued opera vpn, they went ahead to launch another browser called Opera Touch. Opera Touch is different from the normal opera mobile browser. Opera Touch has been designed specifically to work with any mobile device and desktop. Opera Touch is very easy to use with just one hand, Touch brings quick access to the Speed Dial, bookmarks, the back and reload/kill page buttons, and your open tabs. When you open it, the address bar immediately opens up and is ready for you to begin typing a URL or a search query. And when you’re on a website, scrolling up will reveal a button at the bottom of the page that you can tap to access your other tabs or to start a new one. Flow creates a feed of websites that you’ve shared from one platform to the other that you can scroll back through to find what you’re looking for. Opera Touch features voice search function and allows users to scan a QR or barcode to perform a search. Fast Action Button (FAB) is a button that gives you access to it all. It is located at the bottom of your browser screen; and gives you direct access to the most recent tabs and search features. Oper Touch is already available for download on Google Playstore here… while iOS users will have to wait abit to arrive in the App Store. Finally, a dynamic browser from opera with good features. Nice improvement. I love trying out new things so I’m going give it a try. I just installed the App. Though, it’s still in its developing phase but with time, it’s going to be one of the best browsers out there. The browser looks promising let’s me try it out…. nice browser. will give it a trial. Will try this out and see how it looks like. Their browser is always good For downloading. But how speed is this one, and does it have pop up blocker? that’s my main concern. Very smooth and fast. But Even With the adblock Enabled, it still failed to block redirect ads. We have too many good browsers and I don’t think Opera will be better than Chrome for now, since I discovered that chrome does everything well I never bother to try others again as it is use to be. Good for Opera users, I’ll test it out too.